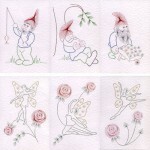 Six new flower border stitching card designs have been added to the Pinbroidery pattern collection. Each card has a different stitched greeting: Happy Birthday, Congratulations, Best Wishes, Thinking of You, With Love and Good Luck. 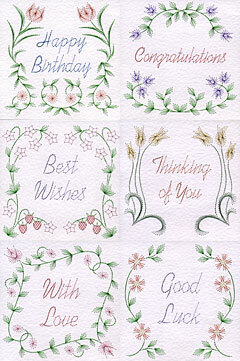 The greetings could be substituted for alternative stitched words, stickers, decoupage or motifs. Square format of 144 x 144 mm (5.65 x 5.65 inches). Rectangular format of 152 x 104 mm (6 x 4½ inches). 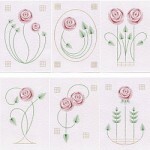 The patterns are available individually and in value packs of six designs. 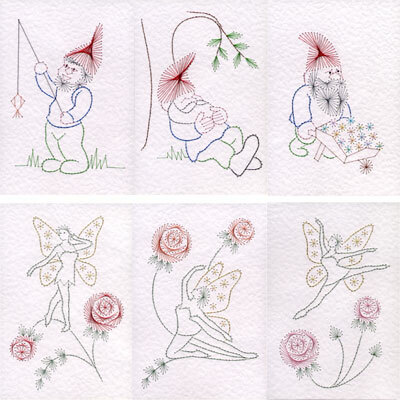 My latest set of designs for the Stitching Cards web site feature an Art Nouveau style rose. The rose design was influenced by a popular motive of the Glasgow Style known as the ‘Glasgow Rose’.